I was at the Doug Mitchell Thunderbird Sports Centre at the University of British Columbia in Vancouver Saturday afternoon for the the doubles match between Canada and Spain. 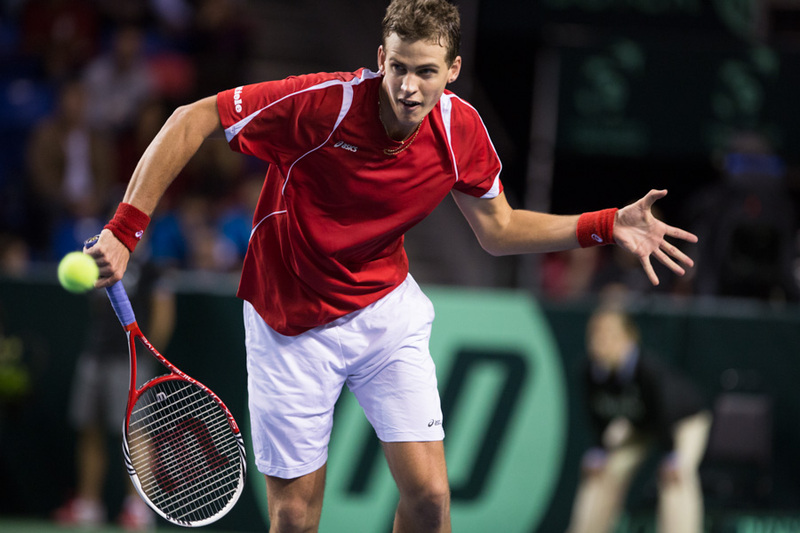 Canada's Daniel Nestor and Vasek Pospisil fell to Marcel Granollers and Marc Lopez 4-6, 6-4, 6-7(4), 6-3, 6-2. 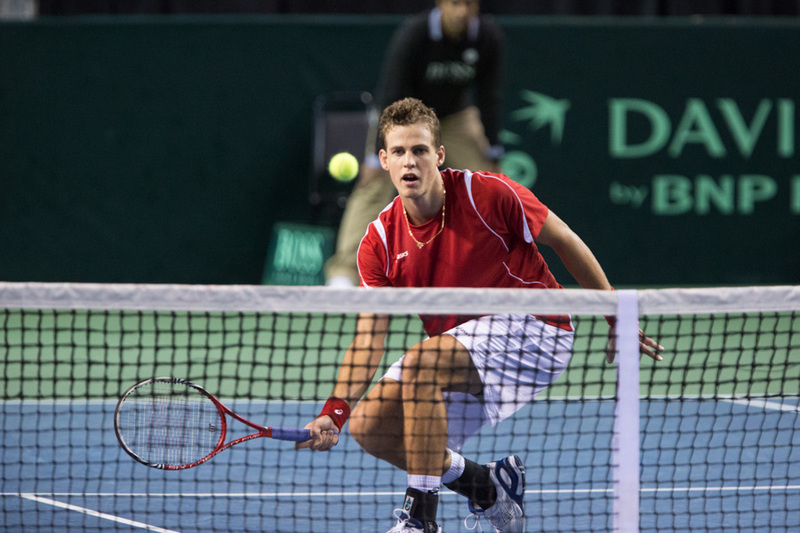 I was primarily in Vancouver to follow Vasek Pospisil. It was tightly contested throughout the entire three hour and 53 minute match. Canada looked at times like it was on the precipice of gaining a firm advantage in the match, but the experienced team of Granollers and Lopez, Australian Open semifinalists just last week, always came back to place pressure on Nestor and Pospisil. 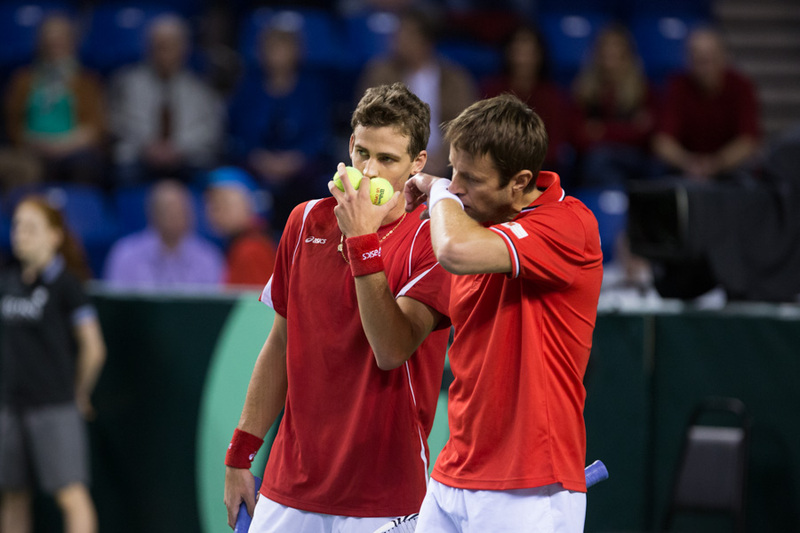 With Canada up two sets to one in the match following a tense tiebreaker victory in the third set, Nestor and Pospisil held break points at both the 1-1 and 2-2 marks of the fourth set but were unable to clinch them. From that point on, Granollers and Lopez, who are ranked world No. 5 and 3 in doubles respectively, looked fresher and they took full control of the match to keep Spain in the running for a quarter-final berth.